As I gaze at this poor, dilapidated little cake, I can't help but chuckle. My boyfriend's favorite flavor is caramel, so I tried to make a version of Whisk Kid's caramel cake. Key word: tried. It was kind of an epic fail. And by kind of, I mean totally. I mean, just look at it! I spent so much time on this cake, and almost everything went wrong. Problem #1: Somehow, I ran out of sugar. Regular old granulated sugar. WHO DOES THAT?! What kind of baker runs out of the most basic fricking ingredient?! I had already been to the grocery store, and I really didn't feel like going back, so I ran over to the gas station across the street and bought all the sugar they had. Problem #2: I definitely should have made three layers instead of the monstrous two I tried to make- the center of one wouldn't bake all the way through, so I kept putting it back in, until it was kinda getting a little burned. So then I stopped. Problem #3: When I tried to split the layers (I wanted to make four), I couldn't exactly keep the slicer level. Hence the unevenness. Problem #4: The recipe called for Italian Meringue Buttercream, which I LOVE. Once I figured out how to make it, it became my favorite. I finally realized the problem, though: using liquid egg whites does not work for IMBC. It works for Swiss, but not Italian (not entirely sure why, let me know if you have any theories..). The recipe called for 10 egg whites, and I didn't want to waste all those yolks, so I tried the liquid egg whites... and it turned out horribly. I was running out of time, and had run out of patience (and sugar) at least an hour earlier, so I went back to American Buttercream. I added the caramel syrup, and it turned out rather nicely. Even though the cake looked dreadful, it tasted AMAZING. The caramel I brushed over each of the layers soaked into the cake, and it all melded together into this huge ball of deliciousness. 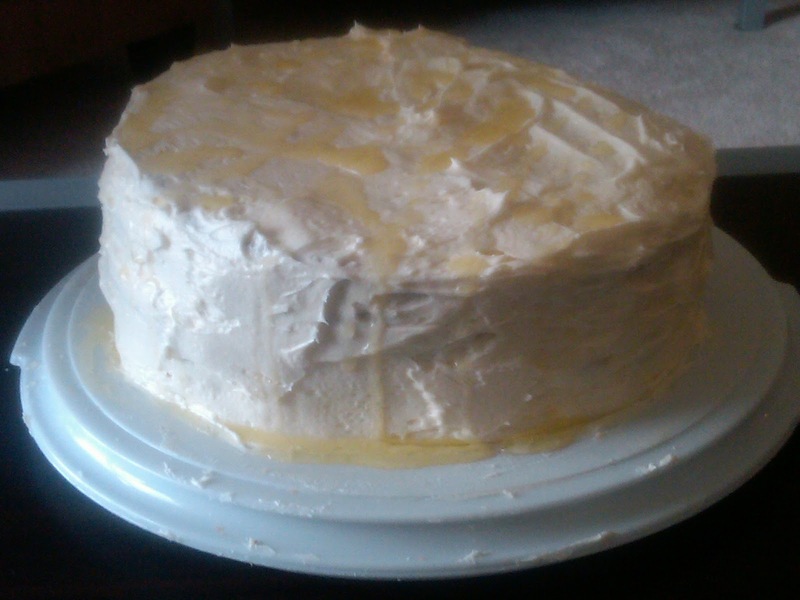 So, I am going to post the original cake and caramel syrup recipes, but I'll post the Caramel Buttercream recipe I made up instead of the IMBC. 1. Combine sugar and 1 c water in a saucepan. Cook, whisking occasionally only after the sugar has been dissolved, until amber. 2. Slowly pour in the remaining 2 c water (BE CAREFUL! Stand back a good distance, cuz it's gonna sputter and bubble and get all kinds of violent!) to stop the caramelizing process. 3. Cook until reduced and sticky between two fingers. 1. Cream butter, then add the sugar and beat until light and fluffy. Add the caramel syrup, then the eggs, one by one. Add vanilla, beat until incorporated. 2. In a small bowl, mix together the flour, baking powder, and salt. 3. Sift half the dry ingredients into the wet ingredients, then add the milk and sour cream and mix. Sift in the remaining dry ingredients, mix until just combined. 4. Pour into three greased 9-inch pans, bake for 35-45 minutes at 350 degrees F.
1. Mix butter, powdered sugar and salt. 2. Mix in vanilla and milk. Add caramel syrup to taste- recommended is 2/3 c.
1. Before the cake is totally cool, spread caramel syrup over each of the layers. Let it absorb, and let the layers cool completely. I think the cake looks delicious! I am sorry it gave you so much trouble. Ha! Haven't we all had a few of those days, but as long as it tasted great, all that matters. One time I ran out of butter for the buttercream and decided to run to the corner store (instead of the grocery store) to pick it up. Well all they had was salted so I literally thought in my head, eh, it couldn't be that bad. Uh! it was so salty.